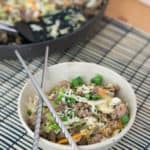 You may have seen the recipe for Keto Egg Roll In A Bowl floating around a lot on the internet. It's one of my favorite meals, so I had to make my own take on it! It's super simple to make, taking less than 30 minutes to prepare, and using only one pan. Clean up is easy! We gave it an Asian flare since that is our favorite flavor profile, but you can go Italian, Greek or Indian! Also Known As Crack Slaw! Crack slaw is a very common second name for this recipe and justifiably so! When using the word crack, you're basically saying it is addictive, and the first time I made this recipe, I was hooked. I made it at least four days a week for the following two months before I tired. But even then, I made it two to three times a week. It's crunchy, flavorful, spicy, hearty and can be made in under 15 minutes for the entire family! Since being on a keto diet, the food that I think we miss the most is Asian foods, from Chinese to Indian. So, of course, we have no choice, but to create low-carb versions of our favorite dishes. This recipe is clearly the remake of egg rolls. Who doesn't love a crispy egg roll any time of day?We also have a low carb cashew chicken, chicken saag and keto butter chicken that hits the spot every time we are thinking of take-out! If there is any recipe on our site I can guarantee you will love, it has to be this one. It's seriously addicting and will quickly become a staple due to the flavor profiles, and convenience of whipping it up in under 15 minutes in one pan. You can also go wild with flavors and up the spice, ginger or soy sauce levels. I've provided my perfect ratio of all the ingredients below, but honestly, any way you make this egg roll in a bowl recipe will be delicious! 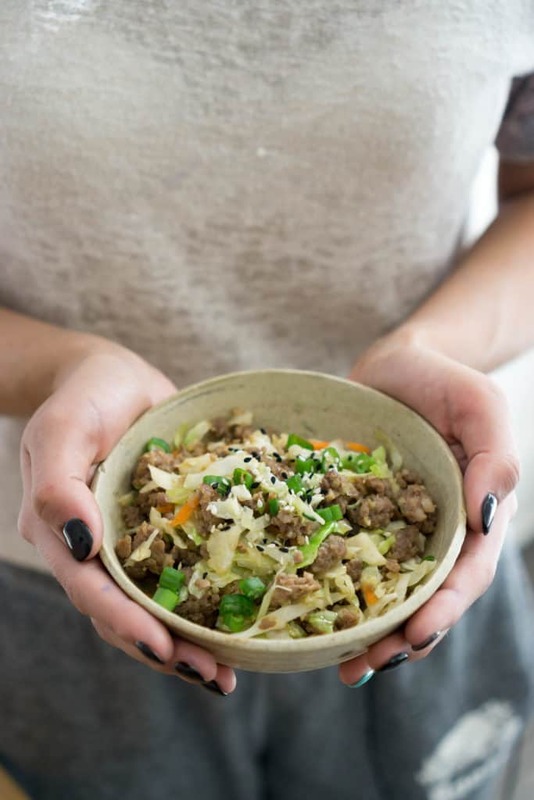 Recipe can be quickly added to MyFitnessPal - Search "KetoConnect - Keto Egg Roll In A Bowl"
Heat a large skillet to medium-high heat. Once hot add in the ground pork. Using a spatula break up the chunks of meat and cook all the way through. Add in the liquid aminos, and chicken broth and stir to combine. Add in the minced garlic, ground ginger and sriracha and combine. Allow to cook for 1-2 minutes as the liquid reduces. Add in 12 ounces of cabbage (we buy plain cole slaw mix) and stir to combine coating all the cabbage in the liquid and seasonings. Once the cabbage has wilted to your liking remove from heat. For more crunch combine and immediately remove from heat, for less crunch cook down for 2-3 minutes. 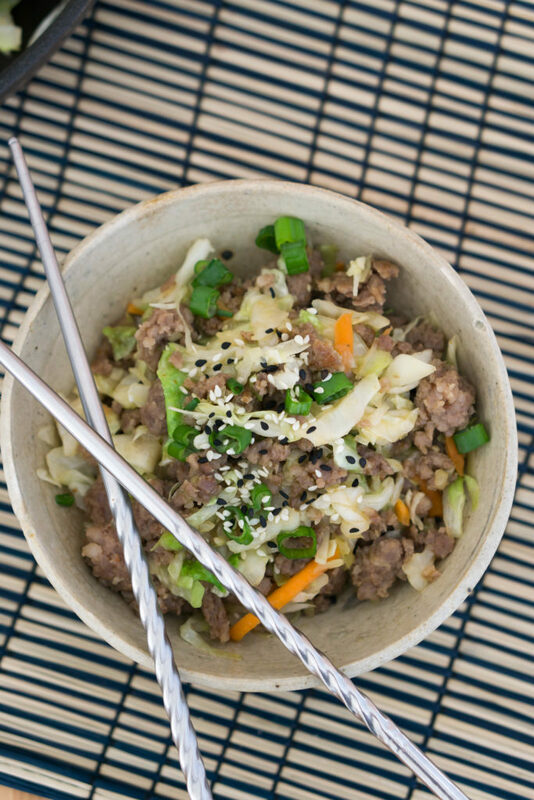 Drizzle with sesame oil and garnish with minced scallions and sesame seeds, if desired. Enjoy! Note: The less cabbage you use, the lower the total and net carbs will be!